It may no longer be the most popular form of long-distance communication, but the postal service used to be the ONLY form of long-distance communication available. And for children attending summer camp, this is still the case. Besides—everybody loves to get real, tangible mail. Campers typically go crazy when they get a letter from back home. At Everything Summer Camp, we understand the importance of communication with your children during their time away at camp. And since most camps limit their campers’ contact with the outside world solely to letters in the mail, we thought we’d offer the Summer Camp Greeting Card Pack. We carry other mailable and mail-related products as well, but NEW on our main site, these Summer Camp Greeting Cards are a great way to let your campers know that you’ve been thinking about them during their time away. Write a little message to go along with the funny, printed message on the card’s front. You can get great advice on writing letters to your kid at camp on this Blog post from the past, written by summer camp expert, Dr. Chris Thurber. A punny phrase like ‘There’s nothing S’MORE fun than camp’ is sure to put a smile on your camper’s face. The pack has other good ones too, like the words ‘Just wanted to shoot you a note’ underlined by an arrow that’s buried in an archery target. Then there’s the one that says, ‘it’s been a while since we’ve spoke’ underneath a bicycle. And, of course, the phrase ‘are you hooked on camp?’ hanging on a fishing line. The Greeting Card Pack contains seven of these paper gems along with envelopes to fit each one of them. They measure 5.5” x 7.5”. 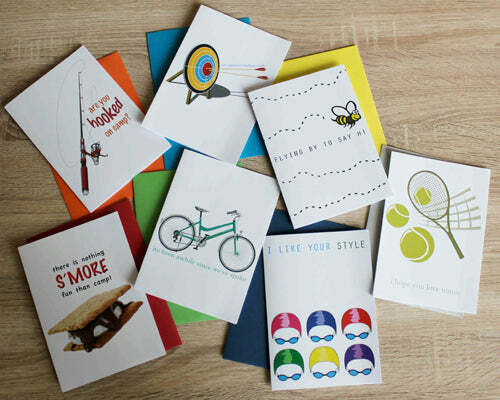 Enjoy these cute cards with your kids and get your Summer Camp Greeting Card Pack today. As always, thanks for reading.